Arteries are pipes which carry oxygen rich blood around the body to the tissues where it is used as fuel to produce energy. The main artery carrying blood out of the heart is called the aorta. In 90% of people with Marfan Syndrome, the aorta becomes enlarged and swollen and this may require surgery to repair it. This is called an aneurysm. Individuals with Marfan Syndrome are born with a reduced level of a special protein called Fibrillin-1. Fibrillin-1 falls into a category of proteins called connective tissue proteins. Connective tissue proteins help to hold the tissues of the body, and in particular the aorta, together. In Marfan Syndrome, reduced levels of fibrillin-1 lead to a special type of inflammation in the wall of the aorta and this leads to weakening of the wall of the aorta. With time, the pressure of the blood coming out of the heart causes the aorta to swell and form an aneurysm. Diagram 1: The diagram above shows a normal heart with the arrow pointing to the beginning of the aorta as it leaves the heart called the “aortic root”. The middle diagram shows the heart of a person with marfan syndrome showing dilation of the aortic root which predisposes to a leaky aortic valve, excessive enlargement where the aorta can rupture called an aneurysm, or spontaneous tearing of the wall of the aorta called a dissection. The diagram on the right shows the heart of a patient with marfan syndrome who has had surgery to replace the aortic root and valve with an artificial tube and mechanical valve to prevent development of an aneurysm or dissection, or to repair a leaking stretched aortic valve. The discovery that inflammation in the wall of the aorta in Marfan Syndrome leads to weakening and the development of aneurysms was an exciting find. This prompted the research group led by Professor Mark Redmond to investigate a possible treatment to reduce this inflammation, and thereby prevent or slow down the development of aneurysms in Marfan Syndrome. Through the generosity of fund raising into Marfan Syndrome, Professor Redmond’s research group have been investigating the role of a commonly used drug, pravastatin to slow down the development of aneurysms in Marfan Syndrome. Pravastatin falls into a group of drugs known as “statins”. These drugs were discovered in the late 1980’s as powerful drugs to reduce cholesterol in patients with cardiovascular disease. However, it was also discovered that aside from lowering cholesterol, “statins” reduce inflammation in the wall of arteries. Because we already know that inflammation in the wall of the aorta leads to aneurysms in Marfan Syndrome, we investigated whether these drugs “statins” would slow down or prevent aneurysms in Marfan Syndrome. To perform a study of this type in humans would take many years so we used mice which have been specially bred with Marfan Syndrome from the famous university Johns Hopkins in the United states. These mice develop the characteristic skeletal features similar to humans with the disease. More importantly however, the mice develop aortic aneurysm similar to humans and this enabled us to test whether pravastatin would prevent or slow down the development of aneurysms or not. The first stage of the research was to set up a breeding program for these mice in Ireland and also to perfect the genetic analysis of the mice to identify the normal mice and the mice with Marfan Syndrome. This enabled us then to develop a research study to test whether or not pravastatin would have a beneficial effect. This research is quite labour intensive as contrary to how it may seem on programs like CSI Miami (for those who are fans of forensic detectives! ), it takes many months of work to get this to work correctly. We also had to learn how to accurately perform echo scans on the mice. Quite a challenge as the diameter of the aorta in the mouse is less than 1/20th the size of a human aorta! The research group led by Professor Redmond identified that mice with Marfan Syndrome had enlargement of the aorta similar to humans with the disease and they also found the characteristic inflammation in the wall of the aorta. The group treated with pravastatin had a reduced level of this inflammation and had a slower rate of development of aneurysm. These results are quite exciting although they are in the preliminary stages. Currently Professor Redmond’s research group are continuing this research to try and identify at what age to start the treatment and how long it would need to be continued. These are important questions to be answered before we could safely start using it in humans. The results of the research to date were presented at the American Heart Association in New Orleans in November 2008. This is a prestigious medical conference with nearly 30,000 attendees from all over the world and gave an opportunity to meet with interested researchers from the four corners of the globe. We are lucky here in Ireland to be one of only a handful of institutions performing this type of research into Marfan Syndrome. The link to the published abstract can be found at this link. The research into Marfan Syndrome is an ongoing process. The money generously donated from fund raising into Marfan Syndrome is used to purchase the equipment and consumable items used in the research and has been invaluable. The individuals involved in the research dedicate their own time outside their normal work to perform the research. All involved are excited about the future prospects at having a safe drug to slow down the progression of the most serious complication of Marfan Syndrome. Marfan Syndrome and Cardiac Surgery Information Evening at Kilmacow Community Centre was most interesting and informative. Kieran Mc Grath welcomed Prof Mark Redmond, Dr Darren Mc Laughlin and Dr John Byrne. Kieran spoke about how the Mc Grath family first encountered Prof Redmond. Geraldine Mc Grath’s first open heart surgery was unsuccessful and as the late Mr Maurice Nelligan was retiring, he handed her medical notes over to Prof Redmond. Mr Nelligan strongly endorsed Prof Redmond. Prof Redmond performed successful surgery on Geraldine and subsequently three of Geraldine and Michael’s sons. Prof Redmond gave an update on Marfan research in Ireland and how the funds raised are spent. He graciously acknowledged the generosity of people in the south Kilkenny and Waterford area. Prof Redmond spoke in some detail about marfan surgery. He then went onto speak about Bicuspid Valve Disease which is a serious medical condition which he encounters more and more. This requires open heart surgery too. Dr Darren McLauglin spoke about the current marfan research on mice in Ireland. He spoke about the importance of beta-blockers in controlling blood pressure in marfan patients. Dr John Byrne spoke about his part in marfan research and outlined how they presented a marfan research paper at the Marfan Conference in America which was subsequently published. This is a huge achievement for such a small country as Ireland. There was a lively question and answer session which was most interesting. This was a unique opportunity with three specialists present, to impart valuable advice. 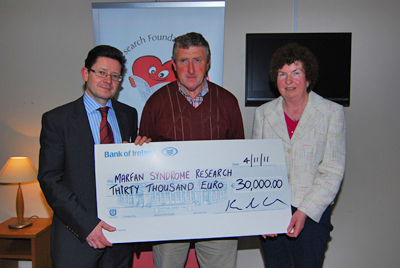 Kieran Mc Grath acknowledged the generous support Marfan Research receives from the local community. He stated the main annual fundraisers were The Pony and Trap Drive organised by Billy Meaney and Mary Corcoran and The Christmas Bag Pack at Super Value, Morgan St, Waterford. Kieran also welcomed Dr John Enright, Mullinavat and Suzanne Redmond. He stated the total amount raised for marfan research to date was €213,350 Prof Redmond was presented with a cheque for €30,000 on the night. It was a successful and enjoyable evening and ended with a cuppa and a chat.